Man, I have fallen off the blogging wagon. I'm glad to be back, because I am really excited about this cake I'm about to share. 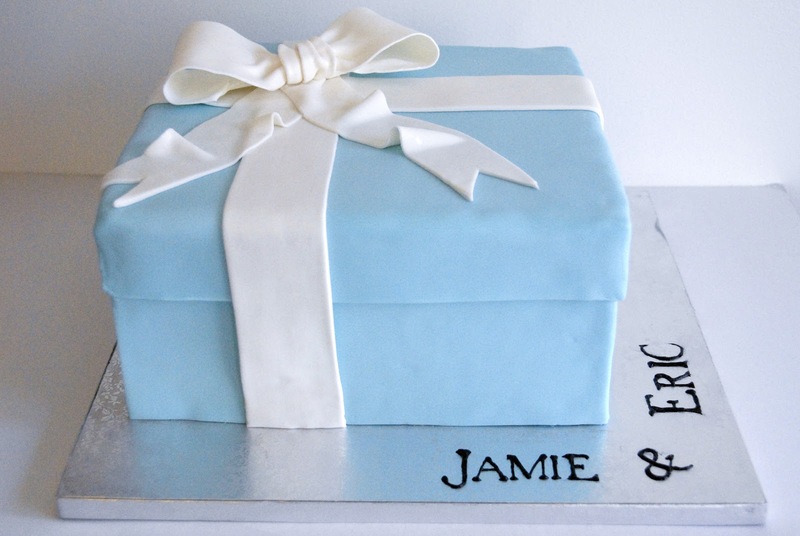 The cake itself is very simple: it's based on a Tiffany box and was created for a bridal shower. Here's where it gets tricky: the bride-to-be is marrying the son of my parents' really good friends... and he's a chef. An awesome chef. Whose career is really taking off and whom I admire a lot. So despite that bridal showers are girly affairs and it's doubtful Eric even saw the cake (at least, not before it was hacked up), and it's equally doubtful the cake was even on his radar, I really wanted it to be perfect. Not to mention, the mother-in-law-to-be is a dear family friend, and I wanted to do right by her (and my mom and the other 16 shower hostesses - yes, 17 in all). Fun, right? There were a number of challenges in this particular cake, and I'm pretty pleased with how they worked out! 1. Fondant color. Have you ever colored fondant? Like, 5 pounds of fondant? It's exhausting on your hands, takes forever to add the right amount of food coloring and mix it in thoroughly, and it requires copious amounts of gel paste. I was terrified that I'd color too little fondant, need to add some, and not be able to match the colors exactly (since, when I've tried to achieve Tiffany blue in the past, it has required a mix of several blue shades). I was in luck to discover that Satin Ice's baby blue is actually more turquoise than light blue. The color was perfect! I had a 5-lb. container FedExed to me and didn't even have to deal with food coloring. Ruefully, the closing of NY Cake West dried up my easy access to a rainbow of fondant colors. 3. Ganache instead of buttercream: I read all sorts of convincing articles about how easy it is to ganache a cake instead of crumb coating it with buttercream. The ganache hardens on the outside of the cake, making super smooth edges and corners, thereby making it easier to achieve sharp corners of fondant. (My fondant corners weren't as sharp as I would've liked, but I'm not going to nitpick.) The ganache was AWESOME to work with! And I'm told it tasted delicious. I filled the cake with chocolate buttermilk frosting and smoothed on a relatively thin ganache as a crumb coat. It pretty much hardened on contact, but it also went on silky-smooth and required way less fussing than buttercream. Between that and the taste, I'm absolutely likely to go the ganache route again soon! And the chocolate was completely hidden by the fondant with no problem! 4. Frozen fondant panels for the box. This is a great method for creating a realistic-looking box with seamed corners. You measure one side of the cake, cut fondant to match exactly, then freeze it for about 20 minutes on parchment until you can actually lift the panel up and it will not bend. Then you mist the ganache lightly with water (the fondant would stick to buttercream, but not to the hardened ganache without a little help), position the panel, and literally stick it on. I measured one panel at a time because I didn't trust my measuring skills and I needed to account for the extra width of the fondant panels on the front and back when I added the side panels. (Does that make sense? There are a lot of online tutorials and videos that discuss the method thoroughly. Here's one step-by-step explanation.) I had to trim each one a bit - particularly the height - but the panels were solid enough to hold their shape and a paring knife did the trick beautifully. As the panels returned to room temperature, they adhered nicely to the cake. The hardest part was the top of the box. I had to roll a square as large as the top of the cake plus an allowance for the sides of the lid (about an inch and a quarter all around) - so I needed about a 13" square. My brain had trouble understanding that, though, and I had to roll, measure, and cut twice before I had the size about right. Then I had to try to center it perfectly on the cake. Ha! Well, it was close. This fondant wants to be pliable, so you roll it and lay it on the top of the cake right away, only after all four side panels are complete. I think I left my fondant out, uncovered (what was I thinking? It dries out super fast!) for a few minutes too long while I fretted, and then it was a little wrinkly at the edges. I was able to smooth it fairly convincingly, though. You lay the fondant, centered (perfectly), on the top of the cake, and then smooth down the sides that will form the lid. Of course, the corners stick out. So you take scissors and cut straight down at the corner, which (if you do it right), forms a nice, straight, seamed corner. Mine weren't so perfect, but I convinced the fondant to behave. Since my piece of fondant wasn't perfectly centered, I had to trim some of the edges a bit to be uniform all around the cake. It was pretty easy to work with, though, so no complaints. 5. 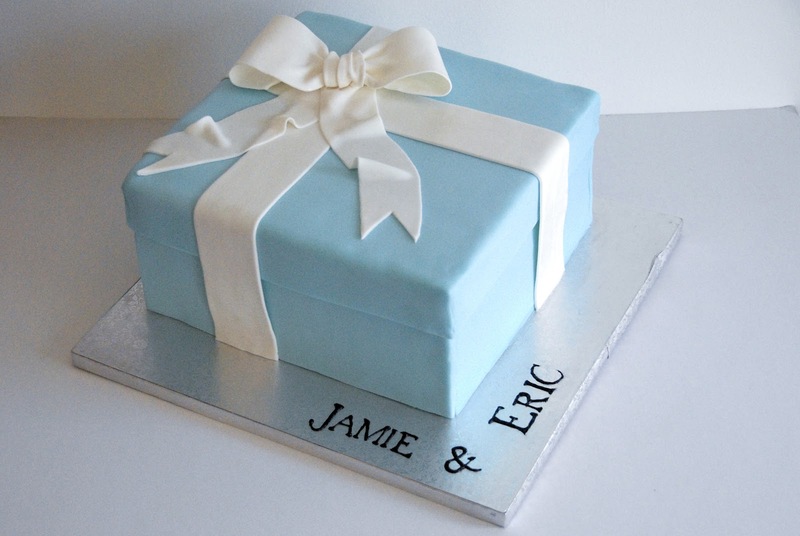 Fondant bow. This was actually pretty easy! To be honest, I used gumpaste, not fondant, because gumpaste dries faster and harder than fondant, allowing the bow to keep its shape more easily. I propped the loops up with rolled up paper towel overnight. The ribbon was cut from fresh fondant, laid on the cake, and I just pressed the bow down gently in the center. I brushed both the bow and the ribbon with a mix of white luster dust and vodka to give it a satin-like shine. 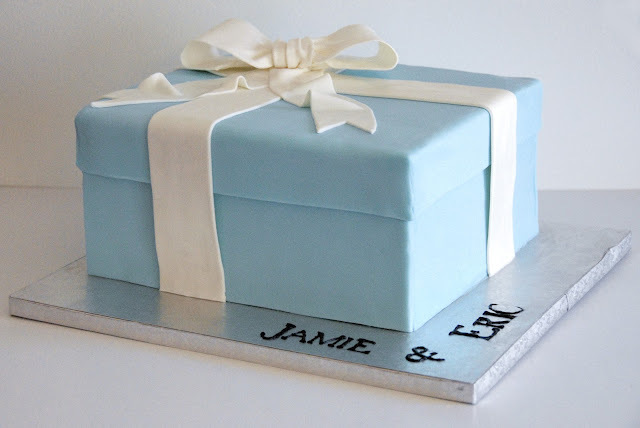 Here's a great, easy-to-follow tutorial for fondant bows. As my friend, Brent, pointed out, it's much harder to do something simple - especially as iconic as a Tiffany box - because everyone knows exactly what it's supposed to look like, and every tiny flaw shows. However, that's also what makes it an awesome challenge! The hostesses - who looked great wearing all black and pearls - oohed and aahed about the cake. It went perfectly with the bling-y table decorations and the Tiffany blue accents. And I'm told the guests enjoyed it, which is all I can ask! 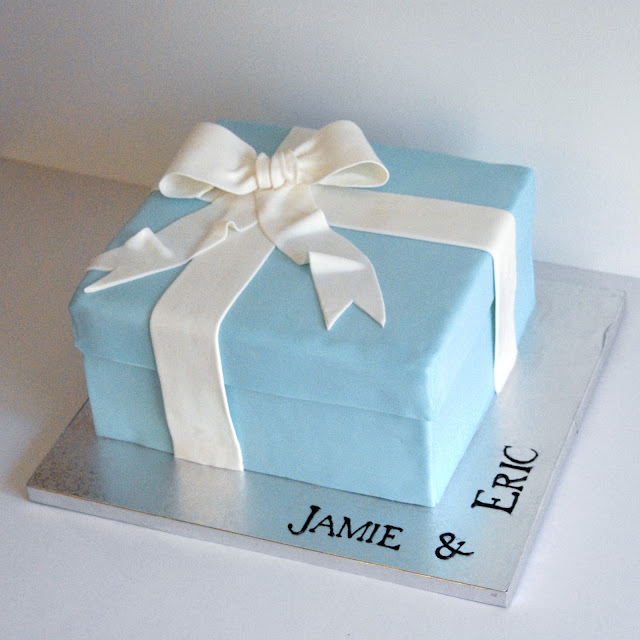 I'm glad I had the chance to make a cake to celebrate Jamie and Eric, and I'm wishing them much love and happiness! This is less of a recipe and more of a "how to," since it's a set of proportions. You can make as much or as little as you like. I think I used 1 pound of chocolate. Both the chocolate and cream are weighed in this recipe, but I did discover that 8 ounces of cream by volume weighed almost exactly 8 ounces, for what it's worth. Place the chocolate in a heatproof bowl, heat the cream until tiny bubbles appear around the edges, and then pour it over the chocolate. Let it sit for a minute or so and heat the chocolate, then stir it thoroughly until the chocolate is completely melted and all the cream is incorporated. Allow it to cool at room temperature until the mixture thickens slightly. It's a good idea to cover it with plastic wrap pressed directly onto the surface of the ganache. If it's too hot, cool it for a while on the counter before covering, but my ganache isn't usually too hot at this point. Alternatively, pour the cream over the chocolate and heat it in 30-second increments in the microwave, stirring in between each 30-second burst. It probably won't take more than 2 minutes total, but it will depend on your microwave. Follow directions above for stirring and cooling. Ganache can hang out at room temperature (as long as it's reasonably cool weather) for about two days. If you make the ganache further in advance, you can chill it in the fridge, where it will firm up completely (ah... the perfect time to make truffles!). But to spread it on the outside of the cake, you'll need it back to a liquidier state. If you're impatient, like I am, you can speed up the process by either microwaving it in short bursts - maybe 20 seconds at a time, then check it - or setting the bowl over a pot of simmering water. Don't beat it, or you will whip the cream and end up with whipped ganache! This is delicious, but it's not what you want in this case. Just warm it, then stir it, and you're good to go! Print Martha Stewart one-bowl chocolate cake recipe. Print chocolate buttermilk frosting recipe. make me want to get up and bake! I stumbled upon your blog looking for a cake idea for a friend. You do beautiful work. This cake is just perfect! This is absolutely lovely! Great job. I'm planning on making a square Tiffany box for a charity auction and I'm quite anxious about the lid! Do you think I could make the lid using the frozen panel technique you did for the actual box? For the lid, I think you just have to be brave and go for it. Measure twice, cut once, as they say in woodworking. Be prepared to trim the edges with a scissor or small knife to get the lip of the box to the right height. I think it will just look better if it's all one piece. You could always practice on a piece of styrofoam or the inverted cake pan and see if it can be done with the chilled panels, though! Good luck!